Footage from a camera phone has sensationally revealed David Moyes threatening a female reporter when he thought the cameras had stopped rolling. 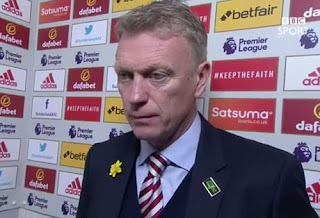 The Sunderland boss, who has since apologised, took exception to being asked if he was under more pressure with club chairman Ellis Short in the stands for his side's 0-0 draw with Burnley last month. During the interview Moyes had abruptly told Sparks he was not under any pressure at all but when he thought his television duties were done, his manner changed. Though Sparks appeared to awkwardly laugh off the remarks, Moyes seemed as though he was not joking.